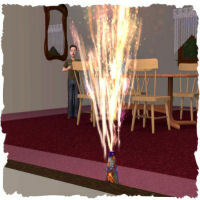 The Sims 2 - Christmas/Holiday Party Pack - Fireworks or damp popper? For the completists and simoholics with a 20hr-a-day habit, you don't need to read the rest of this review. Just go out and buy it or if you can't wait to go to the store, just download it from the official site. You will love what there is and overlook any imperfections. 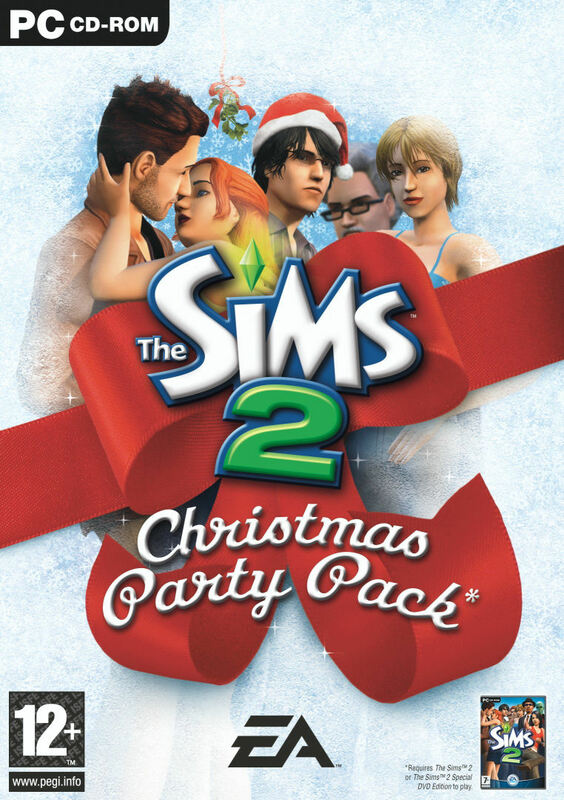 Although I am a completist and glad to have the CHPP (Christmas/Holiday Party Pack), thinking of those who are more "take it or leave it" when it comes to TS2, I am undecided as to whether it is worth it for you. It claims to have 40+ objects and textures and For the European price of Â£10, by that formula, this roughly means you are paying 50p per item. Is it worth it? You decide. Before I get looking around, please note that I am looking for what is genuinely new and has not been a Maxoidmonkey seasonal download from the official site. Firstly, there are 39 new walls/floors, many of which are "variations on a theme". 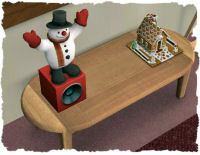 Redecorating and recarpetting your sims' houses just for this season can be very costly on this alone. There are also four new windows. Actually, four revamps of existing windows with the same colour frames but two different frosted glass textures. 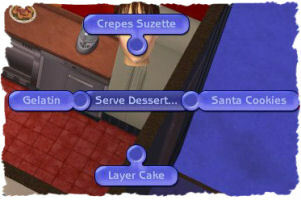 Maxis, why you could not have just introduced these as just new textures is beyond me. There are also six new doors. "Six old doors, each with a festive theme" you're thinking? Close, but wrong. In fact, it's three old doors with two festive themes. One is a bow on the door, the other theme is a wreath, both of which you can have in various colours. Therefore, on an architectural level, if you want your house to look really festive, it is going to cost a small fortune to have your doors and windows replaced. As a small example, let's take a house with 24 of these windows that have depreciated to about Â§45 each, which is Â§50 less than the price of a new frosted window. In order to replace them with their equivalents, the family has to pay out Â§1,200 just for windows. Had these been done as a new texture, the texture change at Â§15 each would have cost the family only Â§360, a saving of Â§840. Maxis, I find this very disappointing, especially considering you've done the same at the Garden Center with festive reworkings of a cactus and a pine tree. "Mummy, why isn't there frost on our windows or a bow on our door? Alexander Goth has them at his house." "Alexander's family can afford to replace their windows and doors in order to get that frosty texture on the window and festive look on the door every year. We can't. It's either new windows and doors that we will have to keep during the summer as well, or you do without getting any presents this year." "You can always go 'kaching', mummy." "Go wash your mouth out with soap! We will not have that or the M-word uttered in this house!!" Moving onto the Buy Mode section, I am pleased to say that my disappointment from what is in the Build Mode has gone. I do feel that Maxis has made an effort here. There are plenty of new items in the Decorative section, many of which have different colour options. These include bows, wreaths, fairy lights, santa statues, reindeer and misteltoe. In Electrical, there is a funky snowman, not dissimilar in style to a "Billy Bass". Finally, in Miscellaneous/Party, you'll find fireworks and party poppers. 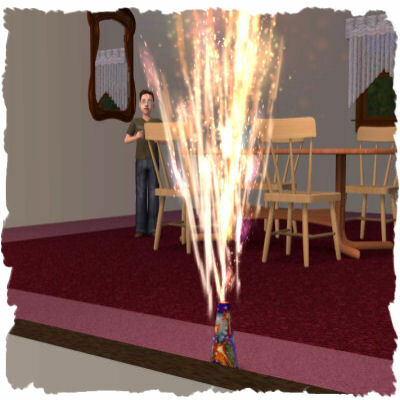 Admittedly, I don't associate fireworks with Christmas but as this is really a Holiday Pack and not just touching one area, fireworks are a major feature of New Year, Will Wright's Birthday, TSZ's Anniversary and other major annual celebrations. 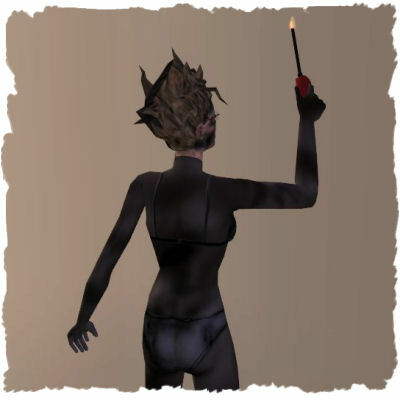 I find the graphics to be very good and quite hairraising in certain cases, as the image on the right goes to show. It would not be the festive season if you could not dress the part. You get to wear the hats just by changing your appearance in the mirror. Also, new clothes can be found under "Everyday". 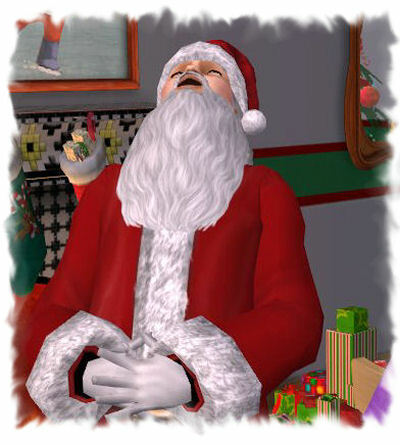 Children can dress up as elves and your adult sims can dress up as Mrs. & Santa Claus or Mother & Father Christmas, depending upon your heritage. This does mean that mummy might get to do more than just kiss Santa Claus. Also, you can serve up Santa Cookies as a form of dessert. If you also have the right combination of other items in a manner not dissimilar to the cookies from TS1, the Big Guy himself turns up in person guffawing away at anything that catches his eye. He hasn't left me any presents yet, though. My sims must not have been nice enough. Considering this CHPP is supposed to be based around Winter's festive season, especially considering the box cover, I would have liked to see a new snowcovered neighborhood terrain, a snow-covered roof texture and an official snow ground cover. None of these three are in evidence and I feel this was an opportunity that has been missed to give that festive element to all areas. To summarise, as a completist and someone with a serious addiction to TS2, I am glad I have this pack. It has given me a fix of new items to keep me going until the 3rd EP ("Open For Business") is released in the Spring. At the beginning of this short review, I said I was undecided as to whether this was value for money for the "take it or leave it" TS2 players and I still am, although erring more to the side of fireworks instead of a popper. You now know what there is. If you are still undecided, I would personally wait and see what else is given out free from this pack during Maxis's seasonal bonanza at the official site through what reminds me as an online form of "advent calendar" every Tuesday, Wednesday & Thursday until the end of next month. Written at 16:50 on Sunday 20 November 2005 by Andy.